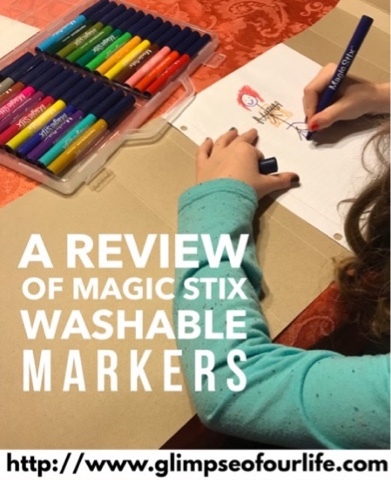 The following is a review of Magic Stix Washable Markers from The Pencil Grip, Inc. with the TOS Homeschool Review Crew. We have had so much fun trying out this 24-pack set of Magic Stix Washable Markers! My daughters both teach music lessons in our house. Most of their students have siblings, so we try to always keep a few kid-friendly things out to occupy them as they wait on their sister or brother. At Christmas, in addition to my favorite but breakable nativity which is now displayed out of reach a little higher, we set out a toy set that my oldest daughter received years ago. Lately, we've had paper and these washable markers available on the table for them to use. I did add a layer of cardboard between the paper and the tablecloth, just in case the color bled through. My niece and her family recently visited us. Their little baby girl is just learning to walk, and their two year old son is incredibly active. 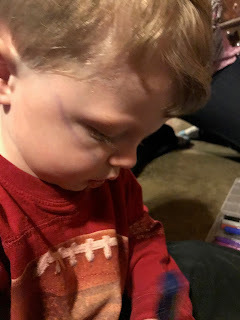 While his parents were talking with us, Matthew actually sat still when I showed him these markers. First I spread out a large piece of paper, next I showed him how to make spiral scribbles, and then he took over. 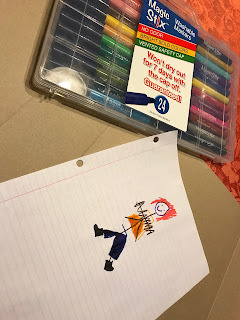 He drew, took off the lids by himself, amazed me by putting the lids back on, and even put the markers back in the case after a few prompts. He tried out almost every single color, sometimes two at a time. And then, was it inevitable? 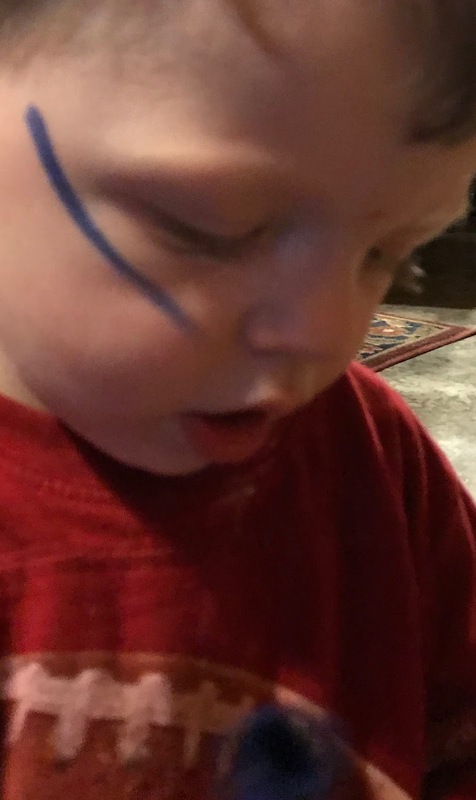 He accidentally marked on his face. We tested the package label's washable claim. It almost wiped completely off (pictured above) with a damp cloth. With a dab of soap and just a little pressure, his blue mark was gone. His mom loved that I got him to draw a circle, and he loved sitting and scribbling. 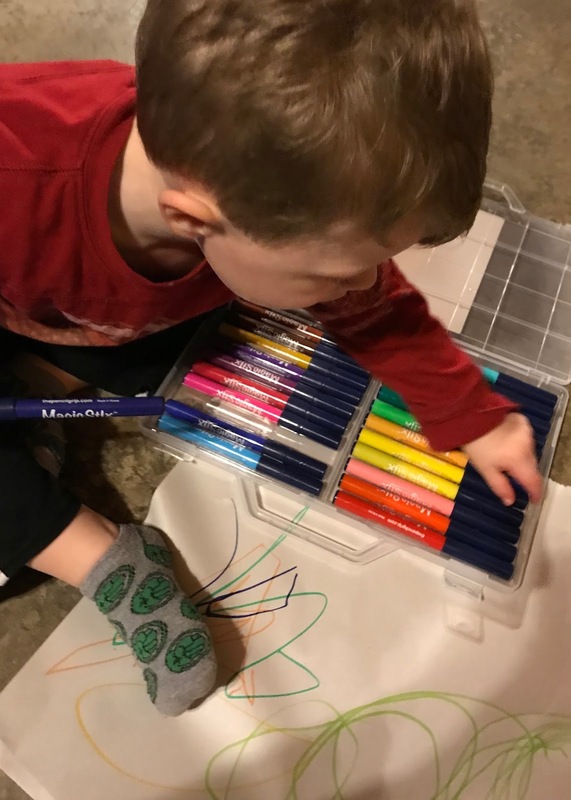 Just like the original 12-pack which we reviewed last fall, these markers have several benefits that are especially helpful for sensory defensive children. These markers have no odor! That's a big deal! The long lasting washable formula is also non-toxic. A lot of attention to details that matter obviously went into the Magic Stix formula. We recently joined a new homeschool group. I heard it again for the first time in a while-- the socialization myth. Apparently, from listening to other parents in the group, grandparents of homeschooled kids are the ones who most often bring up that question. And really, when you think about it, concerned grandparents are a good thing. We do not have a socialization problem. One of the groups that my children have been involved with for over a decade is 4H. We made the awards for an upcoming shooting sports competition, and decided to add a little color to the laser-cut wood. 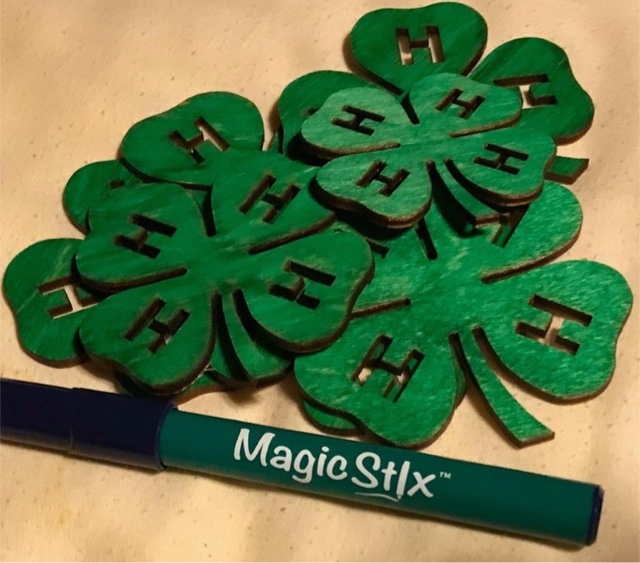 There are five different shades of green in the Magic Stix 24 pack, and one of them is just the right shade for our 4H project. We first tried these markers at Christmas on wooden etched ornaments. Now I like the wood that is colored one solid shade with these even better than the ornaments on which we used multiple colors. They are also available in their original 12-pack, too! The Pencil Grip, Inc. is also giving a 24-pack set of their washable markers to one of you! 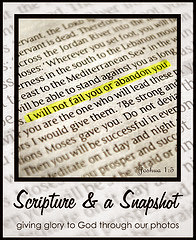 Enter my giveaway after clicking here. Visit The Pencil Grip on Facebook, Twitter, YouTube, and Instagram, and be sure to tell them hi from Jennifer at A Glimpse of Our Life. Disclosure: The Pencil Grip, Inc. provided their Magic Stix markers for this review. All opinions shared are my own. I love the fact that they're odorless and washable! The paper roll with the 6 Kwik Stix looks very interesting and fun to try! I love that your son accidentally wrote on his face and how you washed it off with water first, then soap. Great review! you can leave the lid off for 7 days? Pretty cool! I love that they are long lasting. Knowing they won't dry out in a few hours is a HUGE benefit for moms. I love lots of things about the markers. The colors are incredibly bright, I love love love how the clovers turned out. The colors looks bright and vibrant on the wood. The sheer fact they are washable colors is awesome, having little ones in the house loving to color with markers can often lead to disasters lol. I love lots of things about the markers. The colors are incredibly bright, I love love love how the clovers turned out. The colors looks bright and vibrant on the wood. 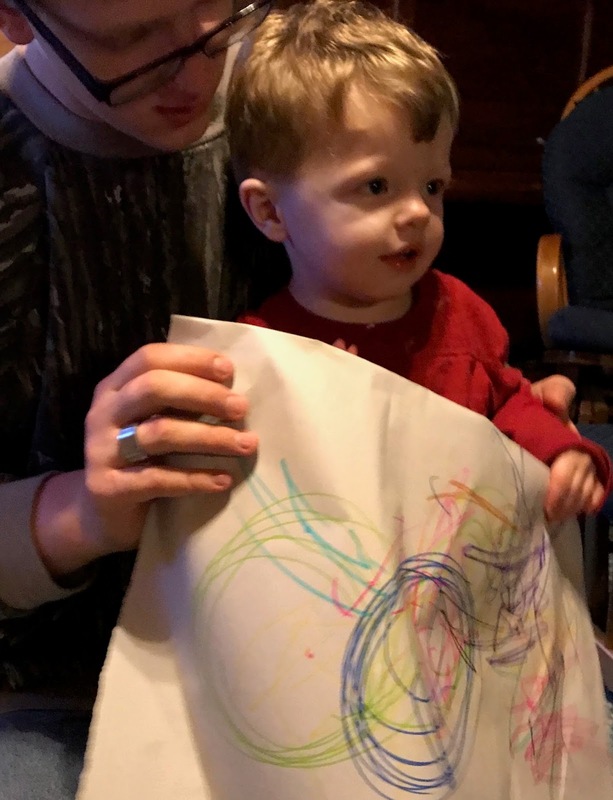 The sheer fact they are washable colors is awesome, having little ones in the house loving to color with markers can often lead to disasters lol. duh i forgot to mark it as my comment lol. been a long day for sure. The thing stick Creativity pack looks fun too. Really love the neon colors . Perfect for spring ! I think they have a lot of neat products! I like the Loopeez! The rubber band ball kit looks like a lot of fun. I love it that they will not dry out. That has always been a problem with ours. my sons would love everything on thepencilgrip.com, but especially the wonderstix! 7 days with no lid is a pretty awesome feature. The Creativity pack looks so interesting. One interesting item that they carry is the Rubber Band Ball Kit - Header Bag. Really like the washable markers that won't dry out! These look like fun! I love the case and how they don't try out. Will be nice for my daughter that homeschools her 3. These seem like wonderful tools for the kids' art and projects. I really like the Kwik Stix Metalix 6PK, they look very cool! I like the Grippies cutlery set.